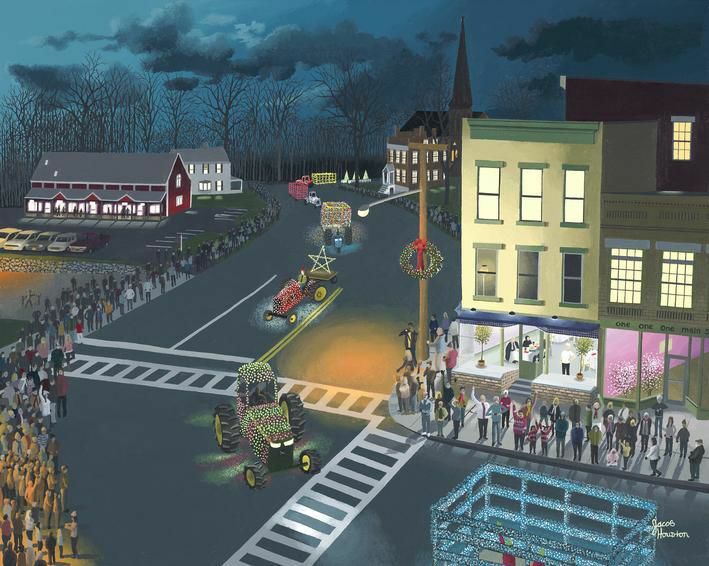 'Greenwich Lighted Tractor Parade' by Greenwich artist Jacob Houston won an award from the Salmagundi Club in New York City. Greenwich artist Jacob Houston talks about the stone Eiffel Tower he built near a stream on his parents' land off Route 29. Houston's paintings will be on exhibit at The Hyde Collection in Glens Falls from Sunday until June 23. Greenwich artist Jacob Houston said a student trip to Ireland inspired this work, called 'Emerald Ireland,' completed in 2014. Being offered an exhibition at The Hyde Collection is a rare distinction relegated to only the best of the best. That’s why Greenwich artist Jacob Houston was stunned when the invitation from curator Jonathan Canning came in the mail last year. Canning first saw the 26-year-old’s paintings during the Washington County Open Studio Tour two years ago. Houston said he remembers Canning’s visit. “He was looking at my paintings. He was silent, then he mentioned he was from The Hyde,” Houston said. His mother, Claire Houston, who manages her son’s art business, Jacob Houston Art, said she had no idea Canning had even stopped by the studio. “I was blown over,” she said. And now, two years after Canning’s visit to Greenwich, Houston’s several-month exhibition, “A Magical World: The Art of Jacob Houston,” opens to the public in the museum’s Hoopes Gallery on Sunday in Glens Falls. The exhibition runs through June 23. According to Canning, the exhibit opens with 18 pieces, although one of Houston’s recent works, “Africa,” may leave the exhibition early if it is selected for the Salmagundi Club in New York City. For the past two years, Houston’s work has been selected for the prestigious National Society of Painters in Casein and Acrylic exhibition at the Salmagundi Club in New York City, and he is hoping to be chosen again this year. Canning said that if Houston is selected a third time for the Salmagundi exhibition, he will be offered membership in the club. Artist members have the opportunity to exhibit several times a year at the club, including the spring and fall auction exhibitions. “It is a painters’ club,” Canning said. Mostly self-taught, Houston said he visualizes his paintings, planning them out long before putting brush to canvas or, in his case, to gesso board. “He remembers every minute detail,” said Claire. Working from noon to 2 p.m. at the dining room table, he begins with a pencil sketch and slowly layers in color. His unique lines and perspective on a building or scene, along with his use of self-blended vibrant colors, are what draw people to his work. The young artist’s favorite color is blue, much like his mother’s, who especially loves the deeply-exotic, cobalt variety of the hue. “I use yellow and white a lot in my painting,” he said. In one of his New York City scenes, “42nd Street,” the intricately detailed architecture draws viewers down 42nd Street and past his favorite New York City pizza joint, Bravo’s, where he’s been known to frequent multiple times on a weekend. Getting lots of brick-by-brick building creation practice, Houston said he loves the computer game Minecraft, where he built the city of London and 82,000 Minecrafters visited his city. Sometimes he gets too close to his paintings and doesn’t want to let them go. “He’s got one in Chicago he won’t let go of,” his mother said. Some artists scrape and paint over sections that just don’t seem to be working, but once Houston sees the image in his mind, he doesn’t share the tortured artist’s struggle. Claire recently bought a painting, “Claire’s Pondering,” that her son created from her own childhood, growing up on a Washington County farm. “I just love it,” she said, showing step-by-step images of its creation from pencil to finished work. “We grew-up on a farm with seven siblings and I would escape and lay in the grass with my St. Bernard. He painted that scene from my childhood,” she said. This past year, the family traveled to Ireland, Italy and the Caribbean. And those visits are now forever remembered in the hues, tints and textured images created from the artist’s palette. “I liked Florence (Italy) the best because it is the birthplace of the greatest artists,” he said, referring to Michelangelo and Da Vinci. Houston dreams of traveling to London, Dubai, Bucharest and Brazil. But mostly he dreams of one day building a gallery across the stream from his family’s Greenwich home. I love this whole article!! What a great thing to read about! Congratulations! We are proud and very happy for you!